Two Whitworth student applicants were selected as Fulbright Scholarship finalists for 2017-18. The university has a long-standing tradition of producing such finalists, with 35 students chosen since 2000. In 2009 and 2011, Whitworth was named a top producer of Fulbright finalists among master’s-level universities nationwide. 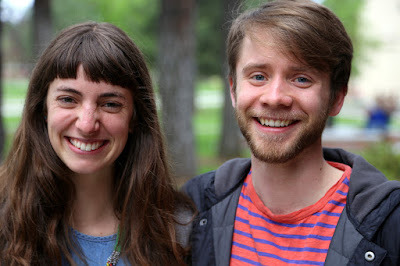 Anne Marie Noll, ’17, a triple-major in history, peace studies, and Spanish, who is also minoring in Latin American studies, and Christopher Volk, ’17, an English and theology double-major minoring in philosophy, were chosen as finalists in Fulbright’s English Teaching Assistant Program, which places highly qualified American students in schools abroad. The participants will live and work in their host countries for nine to 10 months during the 2017-18 academic year. “They are both remarkable young people who truly represent the best of Whitworth, and they will be excellent ambassadors for Christ's love, our university and our country,” says Megan Hershey, Whitworth associate professor of political science and the university’s Fulbright advisor. Anne Marie Noll, who was selected to teach in Colombia, is excited to contribute to the education system in her host country. Christopher Volk, who was selected to teach in South Korea, sees the Fulbright Scholarship as an exciting opportunity to test his Whitworth education. "I'm excited, nervous, and a bit bewildered that I'll be in South Korea in two months,” says Volk. “The year-long Fulbright award provides an amazing opportunity to engage in cultural exchange, language learning and teaching experience, and I look forward to using the skills that I've developed at Whitworth and through Seattle's Union Gospel Mission to help Korean students with their English, and to share American culture. Although this coming year will be challenging, I am eager to leave the lecture halls and stacks of books, [to venture] beyond the ‘Pine Cone Curtain,’ and to have a manifest impact in the real world." The Fulbright U.S. Student Program, America's international educational exchange program, is sponsored by the U.S. Department of State, Bureau of Educational and Cultural Affairs. For more than 60 years, the bureau has funded and supported programs that promote mutual understanding and respect between the people of the U.S. and those of other countries. Megan Hershey, associate professor of political science, Whitworth University, (509) 777-4951 or mhershey@whitworth.edu.